Release 5 has PostgreSQL support. Support for PostgreSQL 9.6 has been added to the API so it is now possible to deploy to AWS and use Amazon RDS or Google Cloud and use Cloud SQL for pain-free deployment and maintenance. Alerta now integrates out-of-the-box with Prometheus and Google Stackdriver and there is native support in InfluxDB Kapacitor for alert forwarding to Alerta. Integration with Zabbix, PagerDuty and Telegram now includes two-way alert acknowledgement. Keep track of individual alerts. Logged in users can manage and watch alerts that are of interest to them. So to make user management as simple as possible there is built-in support for OAuth, SAML2 and LDAP user logins using Google, GitHub, GitLab and Keycloak as well as Basic Auth for situations where OAuth isn't available. The alerta-web docker container has been downloaded 200 thousand times because it's one of the most reliable ways to get going quickly. Easy to configure, it can be used in simple and complex environments. 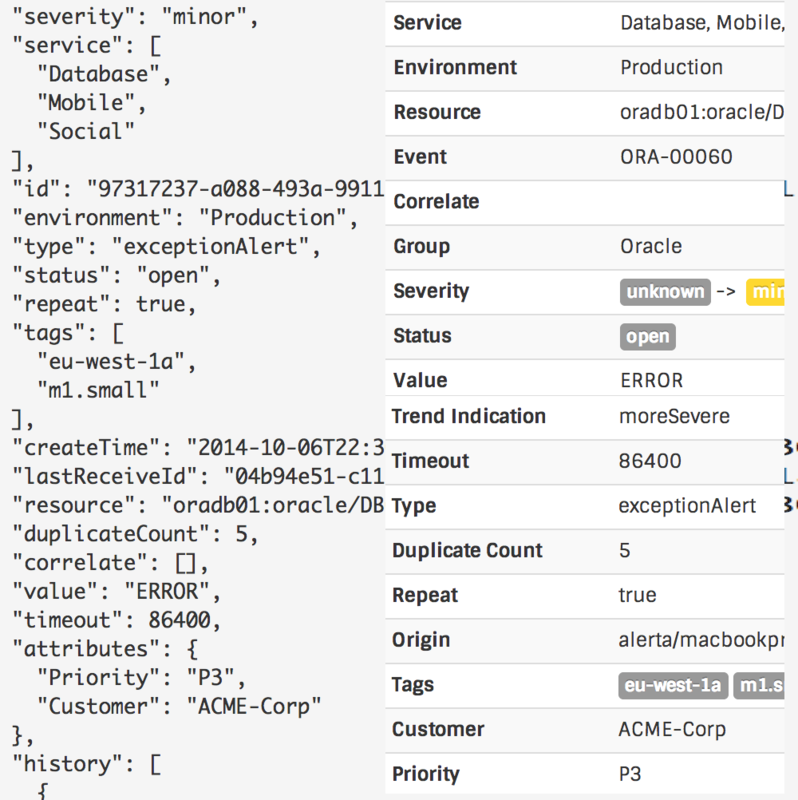 Developers can now use a web UI to explore some of the most important features of the Alerta API -- sending and querying for alerts. Any alerts sent to the API using the explorer can be viewed in the explorer or the web console available online. Manage multiple customers using a single instance of Alerta via customer views. Customers can only see and action their own alerts. An admin user can see alerts from all customers. Email was not designed to be used as an alert console. It is not a scalable solution when it comes to monitoring and alert visualisation. A minimal installation of Alerta can be deployed quickly and easily extended as monitoring requirements and confidence grow. There are integrations available with Riemann, Nagios, Zabbix, Kibana, Sensu, Pingdom and Cloudwatch. Integrating bespoke systems is easy using the API or command-line tool. Alerts are submitted in JSON-format to an HTTP API. 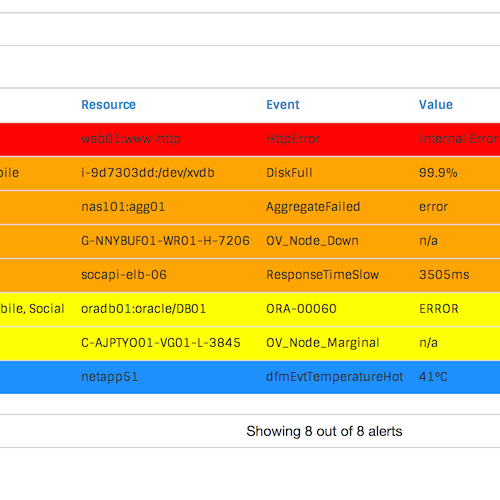 Alerts can be queried from the command-line or viewed in a slick web console optimized for desktop, tablet and mobile. User logins can be added using Google, GitHub or GitLab OAuth and programatic access is managed using API keys. There are standard deployments to AWS EC2, Vagrant, Kubernetes, Packer, Docker and Heroku available to get you going in minutes. Other more complex deployments make use of standard Python package install techniques. All the alerts. Not just the easy ones. Alerta accepts alerts from the standard sources like Syslog, SNMP, Nagios, Zabbix and Sensu. Any monitoring tool that can trigger a URL request can be integrated easily. Anything that can be scripted can also send alerts using the command-line tool. There is already a Python SDK and other SDKs are in the pipeline. Cool. Flexible alert format. Capture what's important to you. Most other monitoring tools enforce their view of the world on you. Not with Alerta. You are free to send any alert with any value. A single alert could be associated with multiple services, have any number of 'tags' in any format, and any number of custom attributes are allowed. Nice. De-duplication and simple correlation. Out of the box. When receiving alerts from multiple sources you can quickly become overwhelmed. 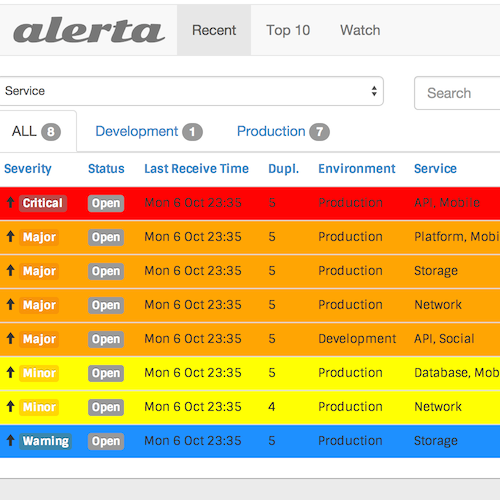 With Alerta any alert with the same environment and resource is considered a duplicate if it has the same severity. If it has a different severity it is correlated so that you only see the most recent one. Awesome. © 2014-2017 Nick Satterly · Creative Commons BY-SA 4.0 License.